Another new project !! :-) Strings And laser beams !! OK, now this one is a first, a combination laser harp, and a harp with strings too ! The commission is for a 33 string acoustic-electric harp with 33 individual RMC peizo transducers, that also has 6 low-powered green lasers built-into the harp. Four of these laser will be set in-line, below the bass harp string, #33, making them 'strings' number 34,35,36, and 37, and the other two will be installed, with one on each side of the sound board. The ones on the sound board will each be aimed down, from the top end to the bass end, running just above the surface of the sound board, down the middle of each side. All six will be aimed at optic sensors that have filters over them to just admit the laser light, so the harp can be played in even the brightest lighting conditions, with no false triggering of the sensors, when the laser beams are blocked by the players hand. OK, so why lasers on an acoustic -electric harp ?? Well they will be used by this harpist to trigger background natural sample sounds like ocean waves and bird sounds in the woods, the wind in the trees, etc. The lasers will also be used to trigger video and still images projected with an LCD projector. This will be done with the custom OptiMusic midi controller and software I use. The harpist will also have 6 floor pedals available to allow her to change the programed sounds and visuals for each piece of music she plays, and to also trigger other lighting changes on stage as well. The harp itself will be carved like a tree trunk, with branches and leaves, out of Cherry wood, with a solid Spruce sound board. But it will weight less than 20lbs. This new harp design is patent pending. First of A Kind New Type of Harp Has Both Laser Beams, And Harp Strings. I have a new commission, for a Egyptian Style Laser Beam harp. This harp will be installed at a location to be-revealed, when it is open to the public, latter in 2009. The harp will have seven low powered green lasers. It will be installed with low level water based fog in action, giving the occasional pulse of vapor, to make the low powered lasers to be more highly visible in normal lighting conditions. I will be posting pictures of it`s construction, when that gets under way latter in January. Here is one of the concept drawings for this laser harp. I will be carved from multible layers of figured Oregon Myrtle wood. this is the same tree as the Bay Laurel Tree. It will be carved to resemble an section of an olive tree w/ branch. There will be some carved leaves and olives on smaller branches, on the upper part, with some gilding. Myrtle wood has a very nice golden brown/silver/and even purple color, with lots of fiddle back figure. I just installed in Sept 2008, a custom designed and crafted a laser beam harp with 8 red lasers, for the "Children`s Hospital of the King`s Daughter`s", in Virginia Beach Virginia. 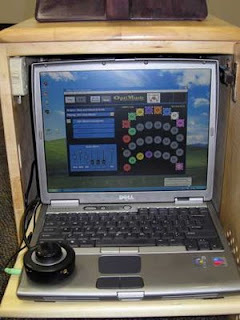 The harp which is the size of a lap harp, is attached to a self-contained electronics cabinet. 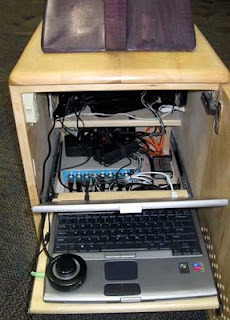 The cabinet which is secured to the floor of the hospital lobby, contains the lap top computer, midi controller, power supplies and the stereo sound system . The harp is made of highly figured Maple, dyed purple, and the cabinet is natural Maple. The lasers are low powered red 5mw, totally safe ones. This laser harp is set to be at a comfortable child height, for the children to play when they come for exams. It can play any kind of sampled wave file or synth sound, as single notes, play-to-end sequences or as loops that keep playing till the beam is broken again. There are all kinds of combination ways to trigger the sounds as well. the software and midi controller are made for me by OptiMusic, and are fully programable, state-of-the-art in capacity. Here are a couple of shots showing the cabinet open to show the computer/with the software showing and the other electronics. Here is some video , showing the harp and the sounds it can make, in action!